We had such an amazing time in Brazil at the end of March; our team was comprised of 27 students and 3 adults. At first it seemed too large a group, but God planned it that way to enable us to do a lot of work with such a short time frame. God set the stage for us the entire way; through the exact number of people and his protection through all security and flights, it was such a great experience for these students and me. AMO, our partner in Brazil, is as strong as ever, the Lord is using them in such amazing ways. He is providing people and connections to spread the name of Jesus Christ in the harshest conditions I’ve seen. For the over 200+ LifePoint’ers who have traveled to Sao Paulo to work with AMO, the people we remember as kids and teens are now leading Bible studies, house visits, presenting the Gospel, and being the hands and feet of the church. That last sentence brings a great amount of joy for me to say; yes 200+ different people have traveled to Brazil from our church. #BeyondSunday = living outside of the walls and living sent! I stood amazed at how BIG our God really is; He has and always will be our Savior who can do anything! Throughout the rest of the week all of our students were able to present the Gospel to people in communities and in the Favelas (slums in Brazil). Brazilians were seeing and hearing the love of Christ from students that LifePoint sent out. It was such an amazing thing to see our students move in obedience to God and to step out of their comfort zones to present people with His Love. I had multiple moments of pure JOY seeing our students walk alongside AMO in fellowship and in sharing their testimonies with people who don’t know Christ in the Favelas. I am humbled and blessed to be a part of a church that sends when God calls. I am beyond blessed to know that our friends at AMO in Brazil are sharing the Gospel and presenting God in His truth to all the people of Sao Paulo! Our ROOTS are set firm in that country as everyone in Brazil tells stories of how God showed them love through someone from LifePoint and how they are forever changed by Jesus Christ bridging the gap to God for them. Post by Justin Morton. Justin is husband to Amber Morton, Smyrna Campus LP Preschool Director, and dad to Joanna. Justin has led several trips of students and adults to Brazil as a Sending Division Leader at LifePoint. Known to many as ‘Coach’ or ‘Morton’, Justin lives sent locally as a high school teacher and football coach at Smyrna High School. You can connect with Justin on twitter and Facebook. If you are interested in participating in a LifePoint Sending Experience, you can read more on the Sending Global page and make contact with leaders. Our first One Day Offering of 2013 highlights opportunities that will change the lives of children in Foster Care locally, individuals and families in Brussels, and women caught in the darkest of chains in Thailand. In this post, we want you to read about the need to serve and impact children in Foster Care in our local community. We have the opportunity to give together and support the incredible actions of Foster parents who are taking on the great task of caring for children whose families are broken. As they welcome children into a new family, they need the encouragement of the Body of Christ for the journey. As members of the Kingdom of God, our Heavenly Father directs us throughout His word to serve the fatherless. Our community and county has too many children without healthy families. So many are enduring hardship because of absent parents or parents going through difficult circumstances. The One Day Offering in May 2013 will support Shepherd’s Supply Clothing Closet of the Rutherford County Foster Parent Association (find them on Facebook). Shepherd’s Supply Clothing Closet serves every child (age newborn to age 17 years) that enters into the Foster Care system and resides in Rutherford County, TN. Their work includes supplying children in foster care with new or gently used age appropriate clothing, new personal hygiene items, and school supplies at no cost. The work of the Shepherd’s Supply Clothing Closet started out of as a great need for foster families. Foster parents have a large amount of supplies and resources they need when they get the call for children needing their love and home. Their response is immediate and often with little ability to prepare for the specific needs of the children they will love and parent. The Clothing Closet allows parents to easily get what they need so they can focus on loving children. We can help these wonderful foster parents so they don’t have to choose shopping and errands over loving hurting and confused children. We can share the love of Christ through clothes, car seats, and cribs. As you pray for your involvement in the One Day Offering know that you are helping remove the stress of material things so foster parents can focus on eternal things. Many of these families are our own LifePoint families. We give together as a faith family on May 5 in our Worship Gatherings. You can also give today or anytime online. Where the Spirit of the Lord is, there is freedom! That is definitely true at LifePoint! On Easter weekend, LifePointers all around the world celebrated the freedom we have in our Risen Lord. The weekend began with the Smyrna and Stewarts Creek Campuses gathering together for a Good Friday Service. This was a special time as we focused on cross and the blood of Jesus and took part in a unique, staff-led time of communion and remembrance. The Lynnwood and Brussels campuses held Easter egg hunts for their communities over the weekend. They each had amazing turnouts. What a great way to bring joy and reach out to people who need the Gospel. 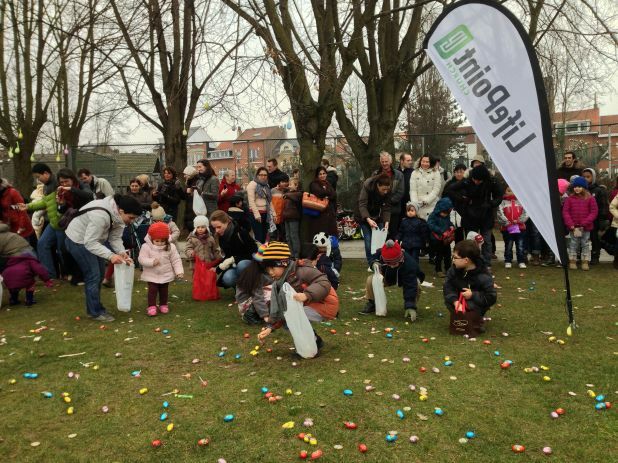 See more pictures from the LifePoint Brussels Egg Hunt. For more info on the Lynnwood Easter egg hunt, check out this previous blog post, Going all OUT for Easter. On Easter Sunday, we began a new series at LifePoint called Freedom – celebrating that not only has Christ set us free from sin and death, but he has set us free to live as a free people! Almost 5,000 people gathered at our five different campuses around the world. One way, we celebrated Freedom at the Smyrna Campus was to have a special time of baptisms during the service. Almost 40 people were baptisms throughout the three services. Check out this video to see all of the baptisms from that weekend. Another way we celebrated Freedom was with the release of a brand new single by LifePoint Music called “Freedom.” The song is free to download from lifepointmusic.com and has already been downloaded by over 700 people around the world. If you would like to know about the song “Freedom,” check out the story behind the song below. Thank you LifePoint, for making Easter weekend such a special time at each of our campuses. Let’s live in the freedom that Christ brings us! Jesus had a deep UP relationship with the Father. He prioritized his life for IN relationships with a handful of men, the first disciples. He gave them truth and his life to imitate that involved high access, high accountability, and high care. Jesus intentionally pursued OUT relationships with those who were in need of the gospel and His Kingdom message and life. This past Easter weekend, the Lynnwood Campus hosted, Eggs in the Park (view images in our Dropbox folder). The event’s focus was to model the life of Christ and pursue OUT relationships with the community. Eggs in the Park was a great community event bringing families of all types together for a fun and safe experience. 11,000 eggs for two egg hunts, bounce houses, artists, and more. Along with a mission team from the Smyrna Campus of two adults and four high school students, the event was a success! The win ultimately is the many invitations prior to the event that were made and the numerous conversations during Eggs in the Park. While hundreds of families played, gathered eggs, and took away bags of candy, LifePoint’ers were deployed on the edges and in the middle of the park connecting and encouraging parents and kids. Many of the conversations were surface conversations, positive and caring. A few moved past the surface, with people expressing their desire to connect more and find a faith family. Now, the LifePoint Lynnwood campus is preparing for their next OUT environment where they will again invite the community for a fun family event . Once again, the priority will be conversations and relationships where beginning steps of discipleship can occur. LP Lynnwood is also celebrating the milestone for its largest worship gathering in its short history on Easter Sunday. Ninety-one people celebrating our Risen King together. Easter weekend was a beautiful picture of scattering OUT, then gathering to celebrate our UP relationship with God. Next, LP Lynnwood leaders are taking action on how to effectively and intentionally prioritize IN relationships to make disciples who make disciples. The result will be LifePoint’ers effectively living OUT so more can experience an UP relationship with a Heavenly Father. All of this for our King, “Your Kingdom come, your will be done…” Matthew 6. The VanDyke family — Steve, Tiffany, Kevin and Leigha — is in vocational missions full time, having spent the past two years in Bangkok, Thailand. They also ministered in India for three and a half years before they joined the LifePoint team in Bangkok. Prior to going to India, the VanDykes have been a part of the LifePoint faith family for years, having they served in several ministry areas and experienced wonderful growth in their faith in Jesus. Steve says his family and the rest of the LifePoint team is working with several Thai believers, pouring into them as potential leaders in the church. Tiffany helps manage the family’s busy schedule, and she also cooks much of the food for the Friday night activities, which the Thai people love. Children Kevin and Leigha attend an international school, which normally would be expensive, but God has blessed them with scholarships. The financial director of the school is a Christian, and wants to have more Christian children as influences within the school, Steve says. You can follow Steve and Tiffany on Facebook and discover more of their story of how God is using them to send the Church to be the Church. Pray regularly for the Bangkok campus and the VanDykes as they make disciples in our culture void of the Gospel.